1226 36th St. NW Washington, DC. (202) 965-1789. The historic restaurant located on a quiet street in Georgetown has the charm of a country inn. It is known as one of the best in the Washington, DC and offers a unique setting for a special occasion. 3073 Canal St NW Washington, DC (202) 333-6774. The restaurant serves sushi and high quality Japanese food. Chef, Sang Joon Kim, graduated Tokyo Sushi School in 1996, has skilled experience from many Japanese restaurants. Fours Season Hotel, 2800 Pennsylvania Avenue, NW Washington, DC. (202) 944-2026. The restaurant serves contemporary American fare with a focus on seasonal ingredients. Steak and seafood are the house specialties. 3251 Prospect St. NW Washington, DC. (202) 333-6138. This first-class Italian restaurant, located in the heart of Georgetown, is popular with the rich and powerful. It has become a Washington hot spot and is a nice place to host a party or celebrate a special occasion. 1039 31st St. NW Washington, DC. (202) 965-2606. The menu showcases the cuisine of Southern France, handcrafted cocktails and a French-focused wine list in an inviting atmosphere, steeped in history and conviviality. 3236 M St NW, Washington, DC (202) 333-9180. The flagship of the renowned Clyde's Restaurant Group has been serving up American grill fare in Georgetown since 1963. The locally owned and operated company has 14 restaurants located in the Washington Metropolitan area. 3000 K St NW # 101, Washington, DC (202) 298-0003. The restaurant promotes sustainable agriculture with a focus on fresh ingredients. With an unbeatable location on the Georgetown waterfront, it's a great place for locals and visitors to enjoy the ambiance. Ritz-Carlton, Georgetown. 3100 South Street, NW Washington, DC. (202) 912-4100. The restaurant, located in one of the city's most upscale hotels, offers a traditional French bistro menu. 1065 31st St NW. Washington, DC (202) 337-4444. The restaurant serves a full range of cuisine from Southern Italy featuring gourmet thin-crust pizzas cooked in a wood-fired oven imported from Naples. There is an open kitchen and the bar has a wide selection of Italian wines. 1063 Wisconsin Ave. NW Washington, DC (202) 338-8800. The Italian restaurant located in Georgetown is one of Washington, DC's finest. 3315 Cady's Aly NW Washington, DC (202) 965-6005​. Leopold's Kafe is an authentic Austrian Kafe located in the heart of Georgetown in Cady's Alley with a beautiful courtyard for outdoor seating. Pastries are hand made and the menu includes Austrian favorites like Schnitzel and Bratwurst. 2813 M St NW Washington, DC. (202) 338-1784. 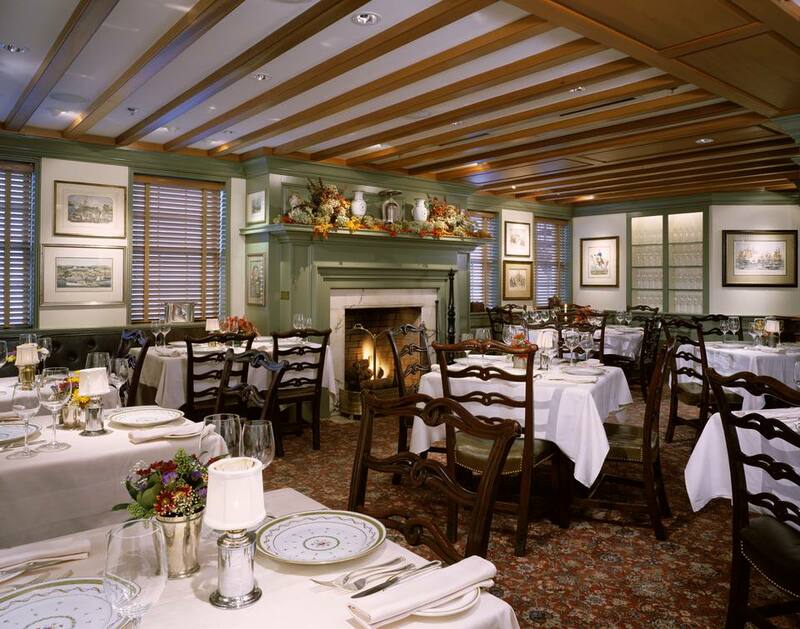 The French restaurant located in Georgetown offers the ambiance of a French country inn. 1206 Wisconsin Ave NW Washington, DC (202) 774-5875. Located in the vibrant Georgetown neighborhood of Washington, DC, the restaurant features ingredient-driven Belgian dishes drawn on French, German and Dutch cooking techniques and traditions. The menu includes specially sourced Dutch-style mussels, traditional ﬂammekuchen (crispy ﬂatbreads) and braises and stews such as Smith’s Lapin a la Kriek (rabbit braised in cherry beer) and more. 1529 Wisconsin Ave NW Washington, DC (202) 621-9162. The Korean restaurant features small plates, hot stone rice bowls and rolls served in a relaxed atmosphere with modern Korean decor. The simple menu offers vegetarian options as well as heartier dishes like Bulgogi BBQ Bibimbap.